Oxygene has offered moonlight skiing with a meal at the Grande Rochette restaurant for the last 10 years. 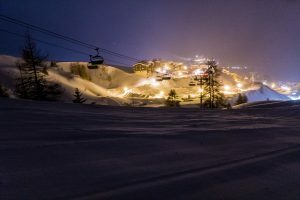 The idea is to take the last gondola of the day to the top of the mountain, have a drink (or two) and eat a delicious locally inspired meal in a warm and friendly atmosphere far from the bright lights of La Plagne centre. This activity is ideal for big groups of friends, families or business groups. As far as team building goes, there’s nothing better than huddling around the fire with a belly full of Savoyarde cheese and a warming shot of genepi in hand. 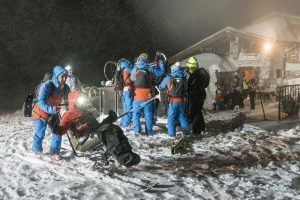 Julien, a ski instructor with a lot of experience organising adaptive skiing courses and events, even said himself, “It was a full-on operation. To organise getting all of the wheelchairs up to the top of the mountain we had to call the piste services in La Plagne. Two of their piste bashers took the wheelchairs up to the top and brought them back down at the end of the evening so they could be ready at the bottom of the piste for our return.” On the night, Julien and the other instructors were in direct contact with the piste services to ensure the safe descent of the skiers and their equipment. Normally moonlight skiing takes place in moonlight however on this occasion it was the light from head-torches that lit the way through the driving snow and gusts of wind. The sitskis had to be cleared of the snow that had collected on them whilst everyone at their meal. The ski runs were freshly groomed and had a covering of fresh snow by the time everyone left the restaurant. The children, beginner skiers, sit skiers, snowboarders and partially sighted skiers all loved the beautiful fresh snow on the descent. The slope is variable but is great as it suits all levels of skier. Even after several glasses of wine and genepi at the restaurant everyone made it down the mountain safely. A spectacular evening for adults and children, that’s the spirit of the Moonlight Ski with Oxygene. 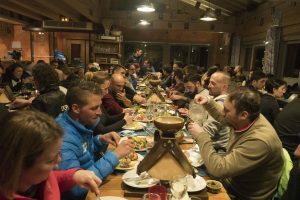 We were delighted to be able to put on this event for the PHS and can adapt this product to any event or large gathering to give you a personalised experience in a restaurant at the top of the mountain at night time followed by some night time skiing. After this particular evening we were approached by some youngsters who wanted to learn more about the mountains. Our instructors, Lorys and Max, responded to their request and were able to organise an avalanche safety session to teach them about the importance of knowing what to do when skiing off-piste and how to search for victims in the case of an avalanche. 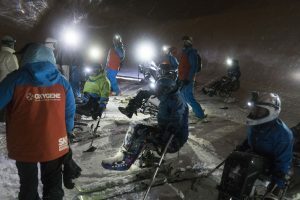 Thank you to everyone, the volunteers, Oxygene instructors, club members, skiers, snowboarders, adaptive skiers and families who spent the week in La Plagne to celebrate the 10 year anniversary of Planet Handi Sport, an adaptive skiing association. Emmanuel Senin created PHS Planete Handisport in 2008. Does an evening on top of the world sound tempting? Organise your group of friends/family/colleagues and come and see us in La Plagne for a ski experience like no other. Meribel Centre or Meribel Mottaret?